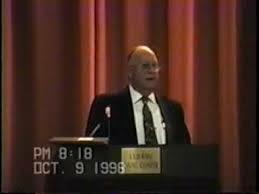 In 1998, Dr, Hoyt Chastain participated in a series of debates with a representative from the Church of Christ. This is his first 30 minute talk during those debates. Dr Chastain told Kevin Pirnie that he had prepared for this debate more thoroughly than any other debate that he had ever done and that this debate he hoped would be the greatest that he ever participated in, in his life. He wanted this debate to be the crowning event of his life. Bro. Pirnie had begun building the Discover the Word Online website and ppromised Bro. Chastain that he would do all that he could do to get the truths in these messages out in the world and here they are. Enjoy the truths that dr. Chastain brings out in these wonderful messages.